This invitation was designed and hand worked in our studio for an autumn wedding in the forest. The invitation and enclosures had the faux bois finish to set the tone for a wedding amongst the trees. The invitation was backed with a natural cardstock to give it more weight and finished appearance and had an acorn and oak leaf charm tied to the bottom. 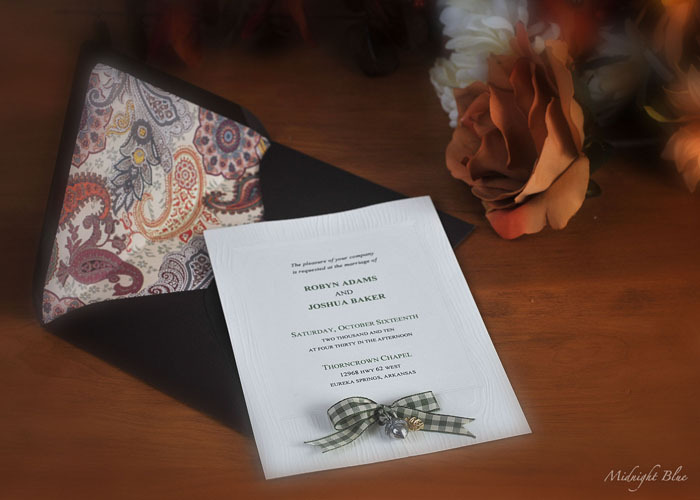 The brown envelopes were lined with beautiful paisley in the rich tones of autumn. We create custom designs for unique couples who want their wedding stationary to reflect their personality and their special day. Contact us for a complimentary consultation. Invitation Design - Way Out West!